I don't want to alarm you, but it turns out that zombies are real. They just happen to be much smaller than we thought--and have antennae. Four new species of fungi that turn ants into little tiny extras from a George A. Romero movie have been found in the Brazilian rain forest. What was originally thought to be a single species, calledOphiocordyceps unilateralis, was recently discovered to be four distinct ones. David Hughes, a Penn State University entomologist, and his colleagues made the discovery after noticing a wide diversity of fungal growths emerging from ant victims, according to the March 2 study in the journal PLoS ONE. 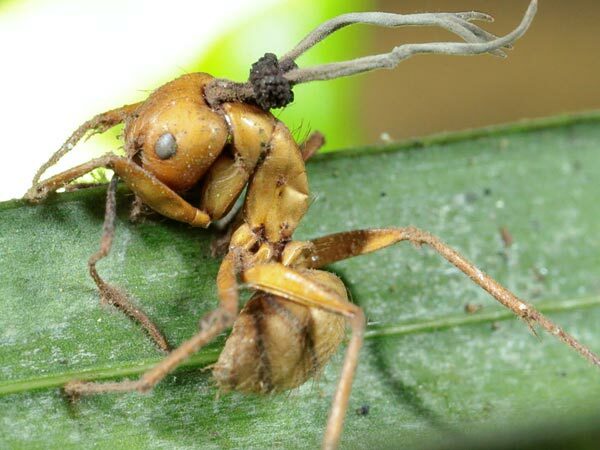 These particular fungus species take over ant brains with mind-altering chemicals, control them like voodoo dolls and then kill them once they’ve done the fungus’ bidding. Kind of like my ex. Imagine you’re a carpenter ant hanging out with your little worker ant buddies back at the colony. Suddenly, you notice Joe doesn’t look so good. His mandibles have gone slack and he’s not laughing at any of your dirty thorax jokes. You shake him and slap his antennae. Nothing. No response. Then, without a word, Joe slowly turns and walks away, never to be seen or heard from again. Joe is on full zombie autopilot now. He finds a small shrub and starts climbing. Once he reaches the underside of a leaf about 25 centimeters above the ground and at just the right angle to the sun, he clamps his jaws on the edge or a vein, anchoring himself to the leaf. As the melancholy soundtrack swells, Joe dies. The fungus then takes over and turns the carcass into an ant-shaped, spore-producing factory for the next year. These spores infect other ants, creating more fungus-loving zombies. And, before you know it, all the ant hills are overrun by hordes of zombie insects. It's like the mall on Saturday. How these species of fungi control ants is a mystery. I suspect it's a combination of pheromones, chocolate, and television signals. With luck and your donations of Lotrimin, scientists will figure it out before a bad case of athlete’s foot fungus turns into World War Z.
you know, todd, i come over here for lighthearted, frothy entertainment, not to be terrified to the point i may actually have to resort to drink to calm my nerves. thankfully i keep a supply of medicinal spirits on hand for just such emergencies, but i'm just sayin. Sorry! But buy a can of industrial Raid just in case.